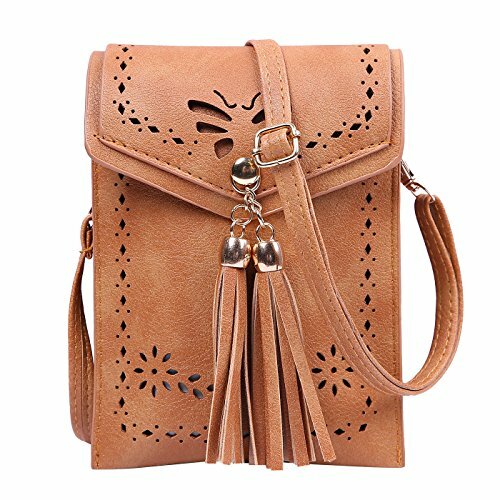 Made of faux leather, the HDE crossbody bag features a fold over flap with magnetic button closure to securely carry your cell phone, (fits all phones under 7" tall and 5" wide, including iPhone 8 Plus), wallet, and other small essentials. A stylish cutout pattern and trendy center tassels provide a retro, festival-worthy look that will stand out while blending right in at your next concert or event. Compact yet surprisingly roomy, this minimalist bag makes a great gift for anyone who likes to travel light. As they say, "Good things come in small packages." Get your crossbody bag today!